I’ve had a terrible headache for a few days and all I wanted was comfort food. I started to feel better today so I decided to make the ultimate comfort food – a slow roasted chicken in my cast iron skillet. I used a bunch of cremini & button mushrooms, shallots, and garlic cloves to form a bed in the skillet to rest the chicken on. I simply seasoned the bird with olive oil, sea salt, and freshly cracked pepper and stuffed it with onion, garlic, lemon, thyme, and parsley. I slow roasted it in the oven and basted the bird every thirty minutes for two hours. The smell in my house while it roasted was incredible and had all of us drooling. 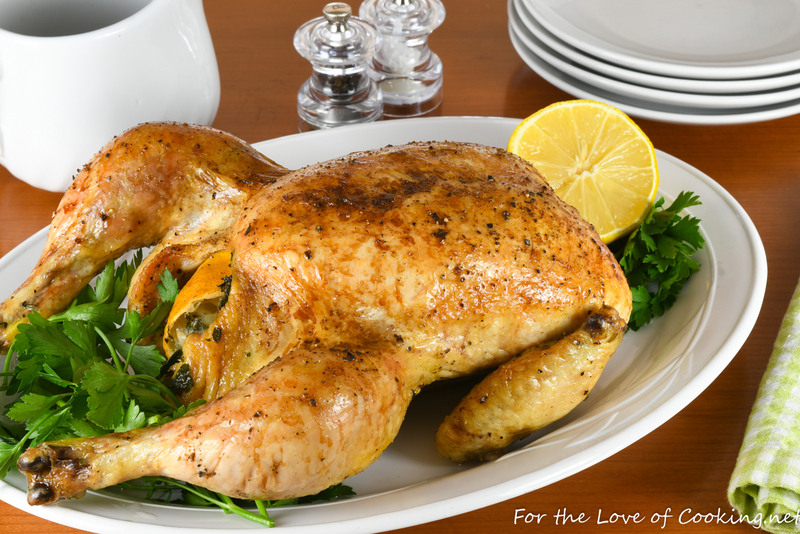 I loved the flavor of the chicken and how moist and tender the meat turned out. We all thought it was delicious and I am looking forward to the leftovers on a salad for lunch tomorrow. Toss the mushrooms, shallots, and a few garlic cloves in the bottom of the skillet. Drizzle them with some olive oil then season with sea salt and freshly cracked pepper, to taste. Toss to coat evenly. Rinse the chicken with cold water then dry very well with a paper towel. Drizzle both sides of the chicken with olive oil then rub it in thoroughly. Season the bird well with sea salt and freshly cracked pepper, to taste. 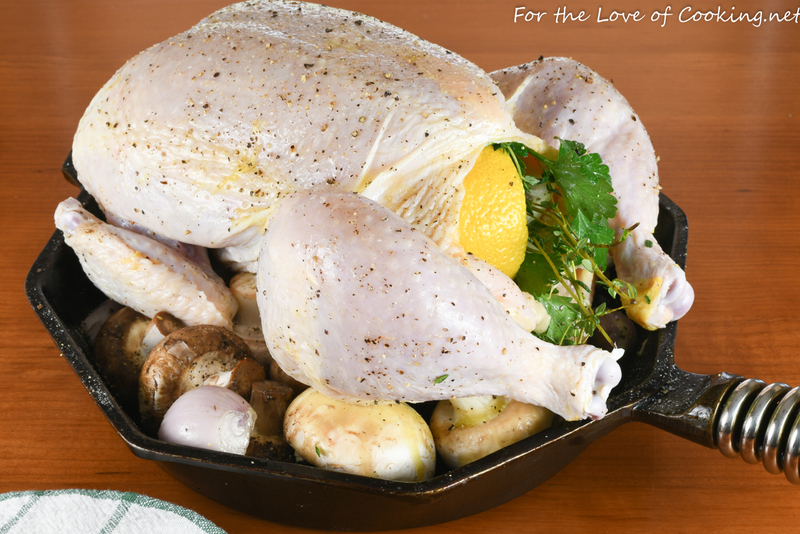 Place the chicken, breast side up, on the bed of mushrooms and stuff the cavity with a half a lemon, some onion wedges, a few cloves of garlic, some parsley, and a few fresh thyme sprigs. 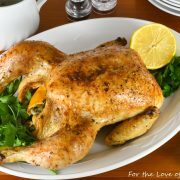 Place into the oven and roast for 2-2 1/2 hours, basting with the pan juices every 30 minutes, until a meat thermometer inserted in the inner part of the thigh reads 170 degrees. 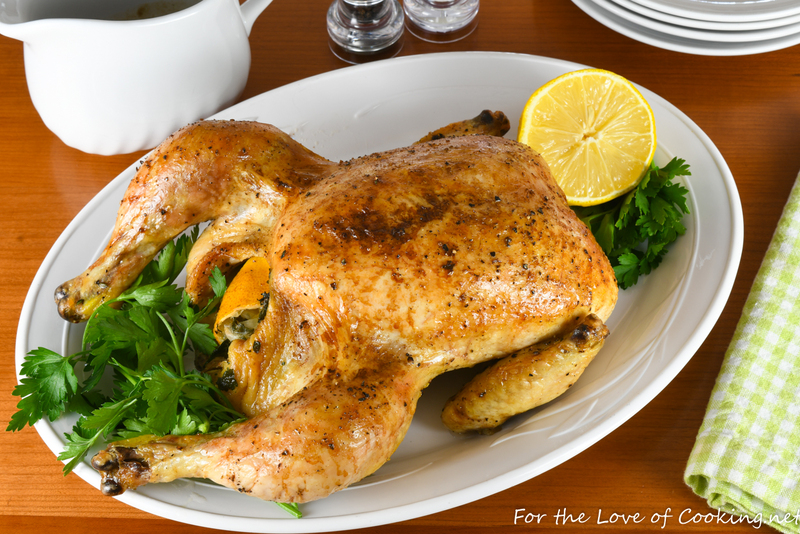 Remove from the oven and allow to rest for 10-15 minutes before slicing and serving. 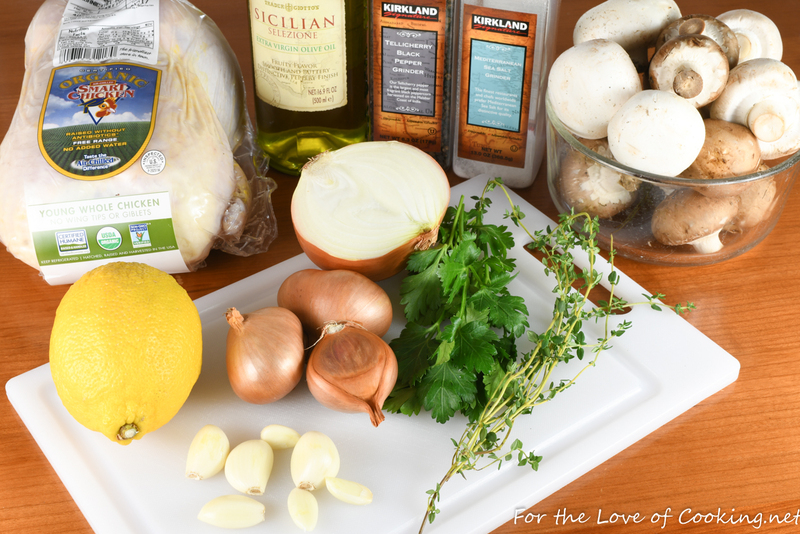 Remove the mushrooms, shallots, and garlic from the skillet, serve on the side if desired. Place the skillet on the stove over high heat. Reduce the liquid for a few minutes, stirring often. Add a dollop of butter, if desired; whisk well. Serve the sauce on the side. Enjoy. Toss the mushrooms, shallots, and a few garlic cloves in the bottom of the skillet. Drizzle them with some olive oil then season with sea salt and freshly cracked pepper, to taste. Rinse the chicken with cold water then dry very well with a paper towel. Drizzle both sides of the chicken with olive oil then rub it in thoroughly. Season the bird well with sea salt and freshly cracked pepper, to taste. Place the chicken, breast side up, on the bed of mushrooms and stuff the cavity with a half a lemon, some onion wedges, a few cloves of garlic, some parsley, and a few fresh thyme sprigs. Place into the oven and roast for 2-2 1/2 hours, basting with the pan juices every 30 minutes, until a meat thermometer inserted in the inner part of the thigh reads 170 degrees. Remove from the oven and allow to rest for 10-15 minutes before slicing and serving. 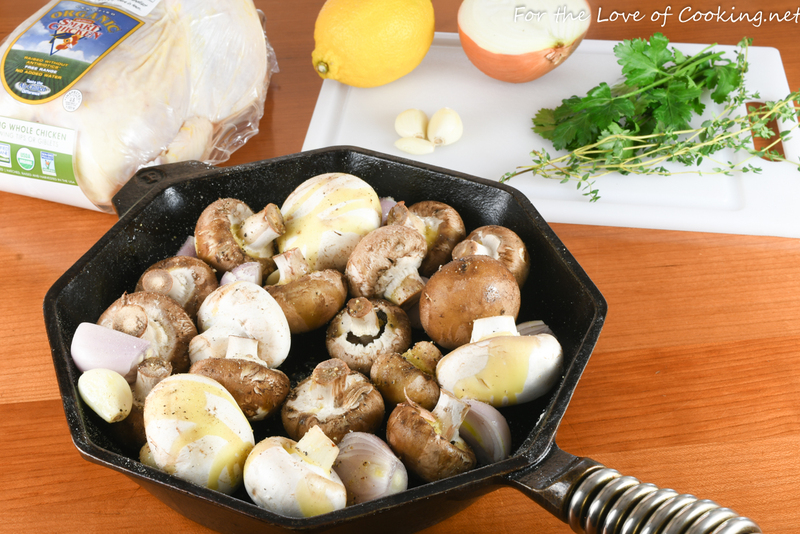 Remove the mushrooms, shallots, and garlic from the skillet, serve on the side if desired. Place the skillet on the stove over high heat. Reduce the liquid for a few minutes, stirring often. Add a dollop of butter, if desired; whisk well. Serve the sauce on the side. Enjoy. So nicely golden brown and simply divine! What a great recipe for cooking a whole chicken. I would definitely like this for dinner. Sorry that your not feeling well led to your cooking this chicken but I agree that it certainly is comfort food.